It is the goal of the Moreland Community Historical Society to preserve the history of the Moreland area for generations to come. We consider that the Moreland Community includes all of the Franklin Township area of Wayne County Ohio. 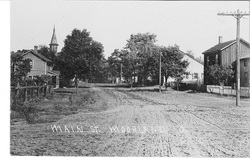 The picture to the left is of Moreland looking north on what is now SR 83 from Moreland Rd.